January 27, 2012 - Pilot leaders at Mesa Air Group, which is represented by the Air Line Pilots Association, Int’l (ALPA), unanimously elected officers to spearhead the union’s efforts. First Officer Marcin Kolodziejczyk was re-elected as the chairman, First Officer Jez Ingram-Clay was re-elected as the vice chairman, and Captain Darrell Cox was elected as the secretary-treasurer. The officers’ new two-year terms will begin in March 2012. “Protecting and advancing the careers of all Mesa pilots remains our top priority,” said First Officer Kolodziejczyk of his re-election to MEC chairman. “The regional industry is extremely volatile and can change in the blink of an eye. As companies continue to compete for business, they will also be competing for qualified professionals due to the looming pilot shortage. “Mesa is at a crossroads. Our pilots are some of the best in the industry and are sought after by other airlines. If senior management expects Mesa to become a viable airline after having recently emerged from a painful bankruptcy process in which hundreds of our pilots were downgraded, displaced, and/or furloughed they need to recognize pilots for the sacrifices and contributions they have made to this airline. This starts at the bargaining table. We entered contract negotiations last year to improve pilots’ working conditions and will continue to work proactively to address their needs, as well as those of the company. Following is a brief bio on each of the Master Executive Council (MEC) officers. First Officer Kolodziejczyk has served as the MEC chairman since October 2010. A CRJ pilot, he has been an active ALPA volunteer since joining Mesa in July 2006. Among other leadership roles, First Officer Kolodziejczyk has served as a status representative for pilots based in Phoenix and Hawaii; he will begin a new term in that capacity, as well, in March 2012. A downgraded captain, First Officer Ingram-Clay flies the CRJ out of Washington Dulles International Airport (IAD). He has served as the MEC vice chairman since November 2011, and is also chairman of the pilots’ Negotiating Committee. Prior to joining Mesa in July 2005, he was part of the management team at the McDonald’s Corporation in London for 15 years. 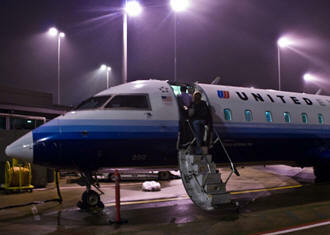 A CRJ pilot, Captain Cox joined Mesa in May 1999 and is based at Chicago O’Hare International Airport (ORD). He is a longtime ALPA volunteer, who has served on various committees at the national and local levels. An expert on pilot scheduling and work rules, Captain Cox was an ALPA-appointed member on the Federal Aviation Administration’s Aviation Rulemaking Committee that recommended changes to flight time/duty time regulations. ALPA represents 53,000 pilots at 37 airlines in the U.S. and Canada, including the nearly 1,200 pilots—and 374 who are on furlough—at Mesa Air Group. Mesa Air Group includes Mesa Airlines, Freedom Airlines, and go!, the company’s interisland carrier in Hawaii. Pilots fly as United Express, US Airways Express, and go!.